I finally picked up GTA IV for my Xbox 360 last Friday and have been playing it all weekend. First impressions are good. The opening cutscenes right away impressed me and lifted my expectations that GTA IV is going to have a better story with better characters than its previous incarnations. The graphics were also quick to impress me, though there seems to be more aliasing than I thought there would be. Or maybe I’m just used to playing PC games where there is virtually none. But the city in GTA IV is very well detailed, which is what’s to be expected in this game. The physics in the game have greatly changed since the previous version. Some of it I like, others I don’t. The rag doll physics that your character and every other pedestrian in the game have are fantastic. Though I learned this the hard way when I first tried to cross the street and was hit by a passing car that sent me flying through the air, landing head first into a curb. It got a good laugh out of me as well as raise my impressions of the game. On the down side, the car physics have been redone and are now harder to control than ever. I guess you can say the vehicles in the game handle more realistically. They definitely feel heavier, so don’t expect to stop on a dime or easily drift around corners like you could in the previous GTA games. I don’t like it, but maybe I’ll get used to it later on. Again, GTA IV is impressing me a lot. I was a little worried because the developers said a bunch of things would be missing in this game that were in the previous games (winged aircrafts, bicycles, parachutes), but now that I started playing this game and have gotten a feel for the atmosphere, any of those missing items would feel out of place. So I’m kind of glad they’re not here. The game definitely feels more real, life-like, gritty, and less cartoony and over the top like the previous games. 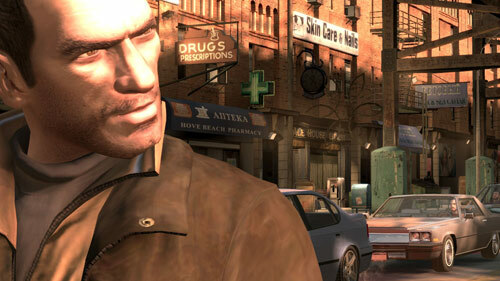 I have a feeling GTA IV is going to be the best in the series by far and I can’t wait to start playing again. So, bye! P.S. I probably post a full review of this game once I complete it.